No matter how good a designer we are, they are times when we face mental blocks that disrupt our design thinking. So in times like these, how can we then boost our creative juices? Here’s another exciting post by our resident contributor py, helping me fill in while I’m off beating my head on some other issues! Is your environment working for or against your creative work? If you have to clear off the kitchen table before you’re able to work, it may be time to set up a space that will be ready when you are. Designing is generally a messy process, but there is a point at which the clutter becomes an obstacle to be overcome rather than an inspiration. Exactly where that line is drawn varies tremendously from person to person, but it is essential that you are comfortable working in the space around you. So other than clearing up my desk space whenever I finish my work, I will arrange my desk space such that my favorite design books are put next to my computer, within my reach for easy reference. Decorating one’s desk space helps to cultivate creativity too. For example I decorate my walls with designer postcards as a form of inspiration. Adapted from The Art of Innovation, by Tom Kelley and Jonathan Littman, on how workspaces are designed in Ideo to promote communal creativity. Our brain can never function creatively at a 100% concentration level every single minute. Psychologists have cited that we are only able to concentrate best at a particular period of the day or night, when we are comfortable with our environment and personal habits. So do take note of the time you are able to concentrate the most, realize how far you can stretch yourself at this period, and notice if it is common for you to always work at this particular period whenever you generate ideas. Some people have common timings of “peak” design creativity, while others don’t. So the best way is to understand how your own brain, mind and body work when you get creative. By realizing your own creative thinking pattern, you can then learn how to better stimulate optimum “design creativity flow”. Isolation is one of the major obstacles that can block creativity, especially when friends and family don’t get what you are trying to do. Thus, having a group of fellow creatives whom you can brainstorm ideas with helps a lot. Because your creative community understands what it takes, they can motivate, inspire and challenge you to expand your vision of yourself and your work. Setting up regular discussions with one another to share each other’s progress will help motivate one’s creative input further. Adapted from “IDEO: Masters of Innovation” by Jeremy Myerson, on creative brainstorming. This illustrates how playing with balloons was encouraged in the team, to create a fun discussion together. Syntactic: By logically breaking down a product into its design parts, this will give a good physical breakdown of the components inside, which gives designers a realistic idea of how the product can be re-designed. Semantic: By conjuring key words or doing a mood collage to define the artistic values of your design concept, it is a good start to creating strong aesthetic meanings to your design. Flipping through books and websites for visual images is often a good method of getting your creative juices flowing. Pragmatic: Weaving a mind map or user scenario is always a clear and visual way to rethink design creatively through the eyes of the users. Not only does it enable a simple breakdown of the factors needed for the design aim, it also cultivates a logical way of design thinking. Designed by Low Cheaw Hwei, Philips’ senior global design director, the above scenario mapping provides a clear visualization of how “The LIVING ROOM of the future” (featured in the Digital Age News Column, Singapore) will look like. When we make a point to read and listen to the design and technology buzz around us, we can learn a lot from what we see and hear. As designers, we can easily fall into the trap of just staring at our computer screens only, and be immune to the environment around us. But as designers, we should always try to take a step back and spend time reading about everyday news and current technologies to keep ourselves abreast, to learn about how new ideas can be improved. By actively reading, we can then build up a strong foundation of how current affairs can apply to design. Documentation of current news that you find interesting is a good way to archive interesting information for design. Whenever I prepare my blogging entries, I’m often subconsciously reminded of the books or news articles I’ve once read before. That inspires me to regenerate new design ideas and topics constantly and efficiently. Whatever I find interesting, I will archive it in my library for future reference. This is often a good practice to keep you updated with powerful information, of which can be used as a good reference for future ideation of design concepts. Excerpts on “the Next generation of Medicine” shown in Popular Scientist Magazine: Life in The Future (Flash Forward Edition). This shows a good example of how a strong understanding of the latest technology brings about creative envisioning of futuristic designs. There are two ways of activating our creative flow, one is brain stimulation and the other is brain relaxation. One way of exercising our brains is to undergo activities like playing with computer games, board games or playing with toys to stimulate the mind. Listening to music is a good way to relax our minds when thinking of design. By listening to the genre of music you enjoy, it prepares and empties the mind for great learning and creativity. So having an MP3 or music with you can be essential to unlocking the creative impulses inside you. Adapted from “IDEO: Masters of Innovation” by Jeremy Myerson, of a typical IDEO work area in Palo Alto, filled with inspirational toys to stimulate the IDEO designers to work creatively. Writing is a good way of exercising our analytical and creative abilities. It is always good practice to document the ideas you have thought of in a notebook or on post-it notes. It helps to record and reflect on your design process. At the end of each project, always try to question yourself on what you have learnt. Also write down the time you took to conceptualized your ideas in your archive. This is so you can self-check your own design progress as well as a primer for good time management. Adapted from “IDEO: Masters of Innovation” by Jeremy Myerson, on one of the project rooms in IDEO, Palo Alto, where brainstorm notes are documented evidence of the creative energy generated by the team. 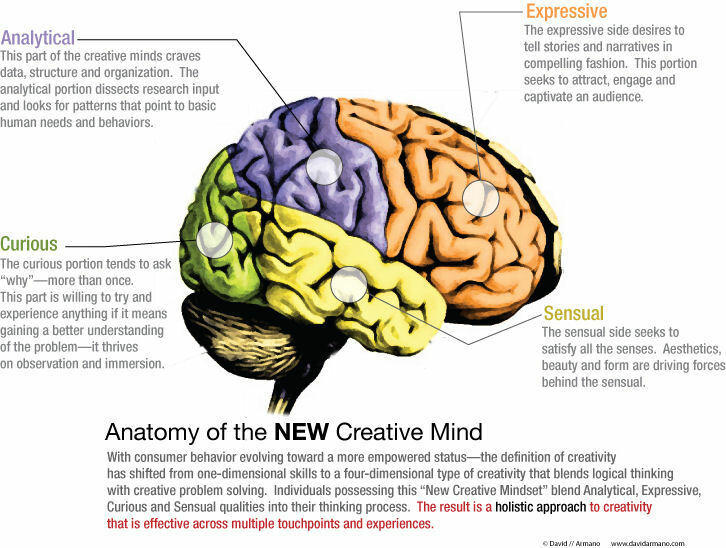 Learning how to unlock the creativity inside us is an important design skill. You don’t need all of them to work at once, you just need to identify some of the ways that bests fits your comfort level and try it. Hopefully you’ll see the difference I time to come! Thanks PY & DT for the article. Here’s my little contribution to break away from an artist’s block. They are not in order of priority. 1) Watch a movie or documentary. 2) Listen to music. No more excuses about having no money to buy CDs. Go to Last.fm or Pandora. 3) Step out of the office for a short stroll. 4) Browse through magazines or books not related to your project. 5) Keep posting questions to yourself. Jolt down pointers or make notes about the project. 8) Go back to the sketching board. Prepare lotsa sketches and try to identify sweet spots. Put these pieces together to form another picture. 9) Go out and take some photos. 10) Exercise if you can. I tend to get insipirations during my morning jog. Looking forward to other contributions. Great tips and many that I myself use as well. Thanks and please keep in touch. Great ideas! I would also add the role of leadership to encourage innovative thinking and developing people. I agree with you that giving employees the active role of leadership will motivate a person to even think more innovatively and creatively within a team. Thanks for the special note.I am truly privileged to receive this compliment from a reputated speaker like you. Great post, and a great blog overall. Creativity is a skill that people sabotage for themselves by thinking it’s reserved to a few ‘gifted’ ones. I think #6 – working in other mediums – is a major one. I’ve recently done some painting with process colours, which both helps encourage creativity, as well as a better understanding of colour mixing. Feel free to browse my blog, where I’m trying to discuss the need of creativity, ways of improvement and some design related topics. I think you would find some of it interesting. You’ve made a new subscriber. Thanks for visiting and your wonderful comments. Please keep intouch and we will check your site out! Thanks for the tips and nice article. I actually get my best ideas when I am in bed or even in my dreams. Working in different mediums is so very important. In deign school sometimes they force you to use other mediums besides the computer for projects to help you break out of the box.